Given a choice of meat from the sea, my first three choices will be - prawn, prawn and prawn! After that, some types of fish, but crab is not on my favourites list! Rarely do I come across some excellent crab that makes me want more and so, since quite a few have asked me about where 'we' get the best crab, I am pinning down the top 3 crab dishes I have had in Chennai. These are my three favourite crab places, in no particular order! I never thought I will rate club food ever in my blog. Yes the food is good and quite cheap, but the crab lollipop here is one of the best crabs I have ever had. There is almost no added flavour at all, just the taste of crab, shanked and deep fried with bread crumbs. The crumbs are hot, but the crabs are kind of cool! I was not able to get a halfway decent picture, so no visual representation, sorry. If you have friends who are members at this club, do try it out. At Rs. 85, this is a no-brainer! These are very similar to the ones at Cosmo, but served as cakes instead of sticks. Pure crab meat, almost no added flavours and fried to perfection. It was so good that I could almost smell and taste the sea! 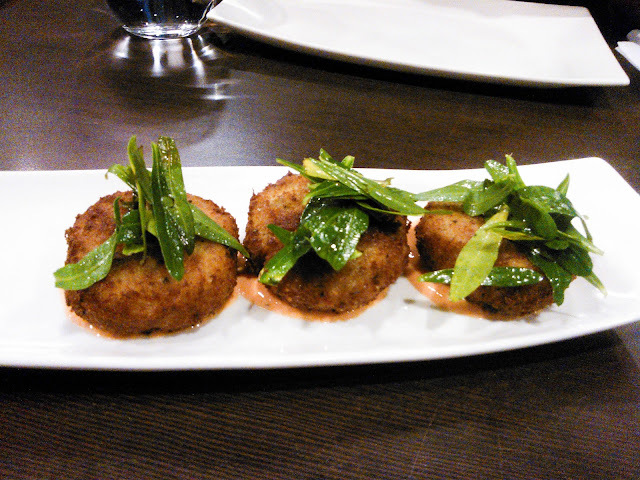 Priced about Rs 300 (I think) for 3 crab cakes. The crab here is completely different from the other two places - this one is full of added flavour and you won't know if it is crab meat at all, except when you really look for the flavour of crab meat. This crab is minced, stir fried with Indian spices, refilled into a crab shell, dipped in egg and deep fried! Amazing stuff and by far, the ONLY place I have had something like this! A single big crab is priced at about Rs. 150 or so, but you have to specifically ask for CRAB in SHELL! The soft shell crab as part of the Maha Virundhu at Souther Spice, Taj almost made it, but if it was top 3, my pick would be the above places!! !